OwyheeStar has put a lot of effort into getting your pup off to a great start. NuVet for the pup is just one more investment in your pup's future. Cliff and Shela believe in the NuVet supplement and what it can do for the Weimaraner--so much so, that they have tied their extended guarantee to this product. Step up to the challenge and extend your pup's basic (one year) guarantee to five years. How can you lose? OwyheeStar recommends using the NuVet Supplements with a high quality grain-free Large Breed Puppy Chow. Although they have used several different Large Breed Puppy Chows, currently they are using the Diamond Naturals Large Breed Puppy. OwyheeStar has been using this puppy chow for three plus years. With all the dog food recalls, we have been fortunate to not incur a problem. ​Remember the Diamond Naturals is higher quality food than the Diamond Brand. Understanding Why More Might Not Be Better! There are many reasons OwyheeStar likes the Diamond Naturals. One reason is it not a puppy food touting that is has a list of exotic additives. Did you know you can get too much of a good thing? It is important to make sure you are not doubling up the supplements. Secondly, are you aware that not all dog food ingredients (this includes added supplements) are equal. Many times even those working for a company cannot tell you where the various additives were purchased. Quality control can be tricky too! 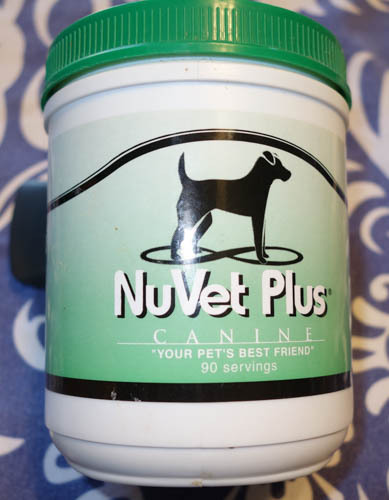 OwyheeStar recommends a simple quality (Large Breed Grain Free) puppy food with the NuVet. Here is how to feed the NuVet etc. OwyheeStar suggests you order one container of the powder; at the same time, they ask that you sign up for the auto-ship tablets to begin at the beginning of the 4 month birthday. It is an opportune time to switch to the tablet form. There are several reasons this approach will be the best. You can easily vary the amount you put on the pup's food which is a good idea--increase it as they grow. Too much of a good thing not necessarily great. The extra supplement will be excreted in the urine. The overage may result in harmless crystals (in the urine which in turn) which in turn irritate the walls of the bladder. Eventually, it can result in may a bladder infection. This bladder irritation is one of the two reasons vets do not encourage supplements. The other is they often like to sell them from their office--to be quite honest, rarely are these vet office supplements come close to the NuVet quality. Typically, there are grain and fillers in other supplements. To extend your guarantee-- order directly from NuVet and use the OwyheeStar number ( 19531). Use the product for five years and OwyheeStar will extend your guarantee (from one) to five years. This supplement is going to boost the pup's immunity and ensure they have the nutrients required for growth. Many dog owners whose pets are immune system challenged​ report remarked improvement. Please check out the testimonials.